(South Boston) John, Jr. (Grant MacDermott) is a college student who has pissed off the Muslim Student Association of his University in the name of free speech. He was incredibly insensitive at a privately hosted but publicly monitored “naked’ party thrown by a fellow college student. He firmly believes that he is entitled to behave in an offensive manner because he is an American citizen. Unlike many kids in his situation, he cannot just let his act of emotional terrorism blow over; he is the son of Presidential nominee John, Sr. (Tom Nelis). Amidst the tumult of election night, Jr. comes to the slow realization that his action affects more than just his immediate circle of friends and family. It has the potential to affect the entire nation. The performance occurs within a sterile hotel room in an unspecified Southern State. John, Jr. interacts with family members and election staff as we, the audience, learn that he is gay, recently had his heart broken and has a precarious mental state due to abandonment issues. The ensemble dances around Jr., trying to convince him to release an apology statement to the press. From his mother, Jessica (Alexandra Neil), to the hipster Matt (Michael Goldsmith) they implore Junior that taking responsibility for his actions is inevitable. Director Michael Wilson focuses the actors on the relationships that they have with John, Sr., a man equally as focused on the mental health of his son as he is on his own political race. Senior embodies all characteristics associated with politics; he is fantastically charismatic and eloquent. Nelis divides the focus of John, Sr. between his John, Jr. and the race with dramatic agility; Senior is a father to the American people as well as his son. Senior and Junior conflict with such animosity because they are so alike. Nelis and MacDermott could be father and son in actuality. Their button pushing reaches beyond the stage and creates a very sincere relationship between two gentlemen unwilling to agree to disagree. Like father, like son, neither wants to be incorrect on their issues but neither wants to compromise. Junior’s über-conservative stance on free speech (revealing that he could be a closeted Republican) is a bigger shock than his sexual identity. for a change, his parents embrace Junior’s diversity. Rather, it’s a battle for bipartisan leadership. 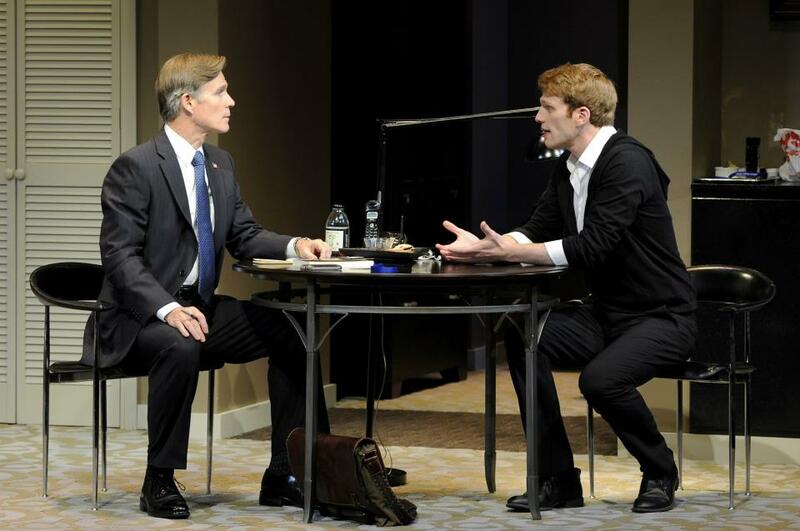 They’re having as much trouble finding equal ground on stage as the Senate does in D.C.
On the surface, Now or Later is the story of a young man refusing to apologize to his family and the world for his ignorant acts. Below the surface, Christopher Shinn reveals the impassioned relationship between a father and son that is as caught up in American politics as it is in family history. Their relationship is a metaphor for the complicated law structure separating church and state which is then compared to the complicated reality of Muslim religion and culture. There is no separation of church and state in the Muslim religion. In turn, there is no separation of family and politics in John, Sr.’s campaign. Shinn’s script is packed to bursting with plot twists that will require full mental acuity to fully digest. It is perhaps too loaded. The average intellectual family experiencing this sort of hullabaloo would require years of therapy. The cast manipulates the script with ease while maintaining a tight bond onstage. Should one tire of the actual election proceedings, this production is an excellent substitute. This entry was posted in Drama and tagged 2012, Alexandra Neil, Calderwood Pavilion at the BCA, Christopher Shinn, Democrat, election race, free speech, Grant MacDermott, Huntington Theatre Company, Michael Goldsmith, Michael Wilson, Muslim, November, Now or Later, October, religion, Republican, South Boston, terrorism, Tom Nelis by Kitty Drexel. Bookmark the permalink.